They noted the tributary creek that once ran past their building, and acknowledged that they’re not right about Mission Creek. They seemed interested in making their presentation more accurate, though it’s a struggle to get every Kink.com guide on the same page. I think I have a good solution for them that keeps the drama of mentioning Mission Creek in their spiel, at the same time increasing their accuracy. Here’s the room with various cuts and trenches that have water seeping in from the surrounding soils. It would be most accurate to say that the water in their sub-basement is groundwater that used to flow into Mission Creek. Think of it like this: The area of the Armory from Valencia to Folsom was a wet marsh more than a creek, until lots of added fill dirt for building the city hemmed it in. The entire area within a block of the Armory is so saturated with groundwater that any basement this deep would have water flowing into it. It’s inaccurate to say it’s Mission Creek. It’s probably just as inaccurate to say it’s the Mission Creek tributary called Old Arroyo Dolores, which is shown nearby on the map. In the building it flows shallowly from east to west, while the water in the area overall flows west to east. This is because it is not technically any creek at all, but leaks seeping across the foundation slab. It appears that the smaller channels were purposely created for accumulating water at the west end of the room. So, it would be most accurate to say it’s groundwater that used to flow out Mission Creek to Mission Bay, before urban landfill destroyed those features. Glad I finally got the full information I craved. 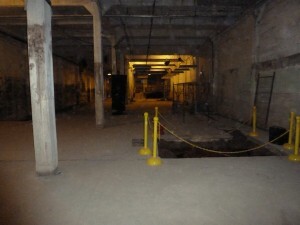 All the photos I had previously seen left me wondering where the water went into and out of the basement. My video shows it all.